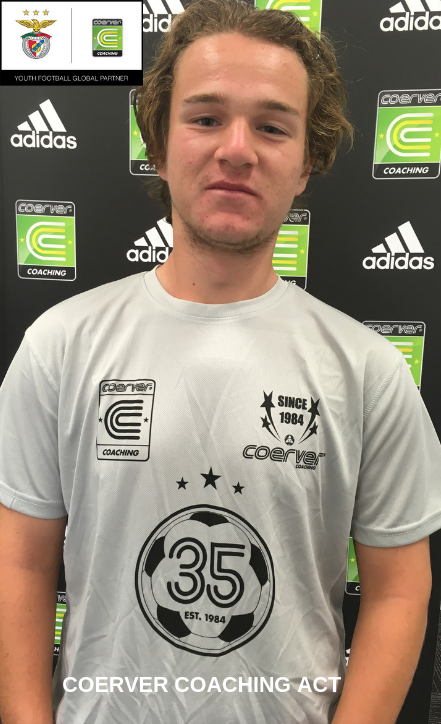 Coerver Coaching ACT recently caught up with Coerver Coaching ACT player Callum Lightfoot who will be traveling to take part in the Coerver Coaching/Benfica International Elite Development Program. CC. What are you most looking forward to during your time with Benfica? CL. What I am looking forward to most with my time at Benfica would be the opportunity to immerse myself in not only a different culture and football culture, but being able to participate and live like a football player which I believe will greatly improve my game and allow me to see what is required to take that step into becoming professional. CC. What do you think will be the biggest challenge you will have to face at Benfica will be? CL. The biggest challenge I believe I will face at Benfica will be the raised standards of competition I am expecting to face there. Canberra has limited exposure to elite players from elsewhere so I believe that being with Benfica will challenge me to push my own limits and extend my game further. CC. How has Coerver Coaching ACT prepared you for trip to Benfica? CL. Coerver Coaching ACT has been instrumental in my development as a goalkeeper and footballer. Coerver provided me with the means to train as well as improving my foot skills through continuous ball mastery and also my goalkeeping technique through its goalkeeping program. CC. How did the Coerver program improve your game and what is it that makes the Coerver program so unique? CL. What makes Coerver unique from other programs is not only the Coerver pyramid of player development and ball mastery, which both challenge players to develop and pushes them to be better footballers, but also the coaches and the mentality of Coerver football. Coerver mentality is definitely about not giving up. The coaches are extremely supportive of this mentality and are always glad to help players reach their potential, and this is what I believe makes Coerver unique from other programs. CC. What advice would you give to our young Coerver players in our programs? CL. Advice I would pass on to other young Coerver players is to constantly focus on your ball mastery and practice the routine exercises. While finishing and group play make be more exciting, the ball mastery and skills taught at Coerver are the reason for not only my development, but these techniques are seen on the world stage with professional players such as Tom Rogic using them. So I cannot stress the importance of practicing the ball mastery taught at Coerver. From all of us here at Coerver Coaching ACT we wish Callum all the best for his Coerver Coaching/Benfica International Elite Development Program experience.